The following press release contains misinformation about Yun Gee’s personal life. There is no evidence found that he suffered from mental illness or had any major breakdowns. Furthermore, Yun Gee continued to paint, write and invent throughout the 1940s and 1950s. Wehn he was only 15 years of age, in 1921, Yun Gee emigrated from his native China to San Francisco. Subsequently he lived in Paris and New York, settling permanently in New York from 1939 until his death in 1963. Like many fell0w-immigrants, he suffered the tensions inherent in the assimilation of a disparate and frequently hostile culture, coining his own phrase for a condition he referred to as “the American loneliness.” But Yun Gee is set apart from his contemporaries in that he sublimated his experience into works of art which carried him perhaps even further esthetically than he travelled geographically. Moving from early traditional watercolors done in a village near Canton, China, to exploration of modernist color theory, he finally achieved the synthesis of modernism with a personal vision which identifies him as a unique American artist. In San Francisco, Gee studied with the painter Otis Oldfield, who had lived in Paris for many years and introduced Gee to Synchromism and Orphism, and with Gottardo Piazzoni, whose work exemplified the Impressionist influence on Bay Area art of the period. Caught up in the dynamics of the San Francisco artists’ community of the 1920s (the poet Kenneth Rexroth and the painter John Ferren were among Gee’s circle of acquaintances), Gee organized the Chinese Revolutionary Artists Club, held classes in modern art, and helped establish the cooperative Modern Gallery, where he held his first one-man exhibition. It was through this exhibition that he met the art patrons, Prince and Princess Achille Murat, who purchased several of his paintings and encouraged him to go to Paris, where they maintained a lively salon for artists and intellectuals. A major exhibition comprising seventy-two paintings and drawings and a catalogue reviewing Gee’s oeuvre have been organized by The William Benton Museum of Art at The University of Connecticut with Professor Joyce Brodsky of the Art Department as guest curator. Included in the exhibition are portraits (one of the artist Piazzoni), street scenes from San Francisco and New York and the major canvas Wheels: Industrial New York. This seven by four foot painting was first shown in 1932 in the Museum of Modern Art exhibition “Murals by American Painters and Photographers,” which also included mural studies by Charles Sheeler, Georgia O’Keeffe, Philip Evergood and Reginald Marsh, among other contemporaries. The exhibition of “Paintings by Yun Gee,” opening at the Benton Museum on October 13, hopes to present in a scholarly and systematic manner, a selection of work illustrating the development of this extraordinary American artist. During his lifetime, Gee’s work was exhibited in Paris in the “Salon des Independents” of 1929, as well as in one-man exhibitions at the Galerie Carmine, Galerie Ferme La Nuit and Galerie Bernheim-Jeune. Several of his paintings were sold by the leading French dealer, Ambroise Vollard, from the Bernheim-Jeune gallery and from the Galerie Lion d’Or in Lausanne. In New York, he exhibited with Sunchromist painters Kupka, Macdonald-Wright and Delaunay, had one-man exhibitions at Milch, Lilienfeld and Montross galleries and was included in group exhibitions at the Brooklyn Museum and the Museum of Modern Art. Gee is represented in the Hirshhorn Museum and Sculpture Garden in Washington and The Whitney Museum of American Art, as well as in private collections in Europe and the United States. The exhibition at Storrs, made possible by the careful preservation of a large body of the artist’s work by his widow, Helen Gee, and his daughter, Li-lan, remains on view at the Benton Museum through November 18. It will subsequently travel to the Weatherspoon Art Gallery of The University of North Carolina at Greensboro (February 10 – March 9, 1980), to The Oakland Museum in California (March 18 – April 29, 1980), and to The Bowdoin College Museum of Art in Brunswick, Maine (October 17 – November 23, 1980). 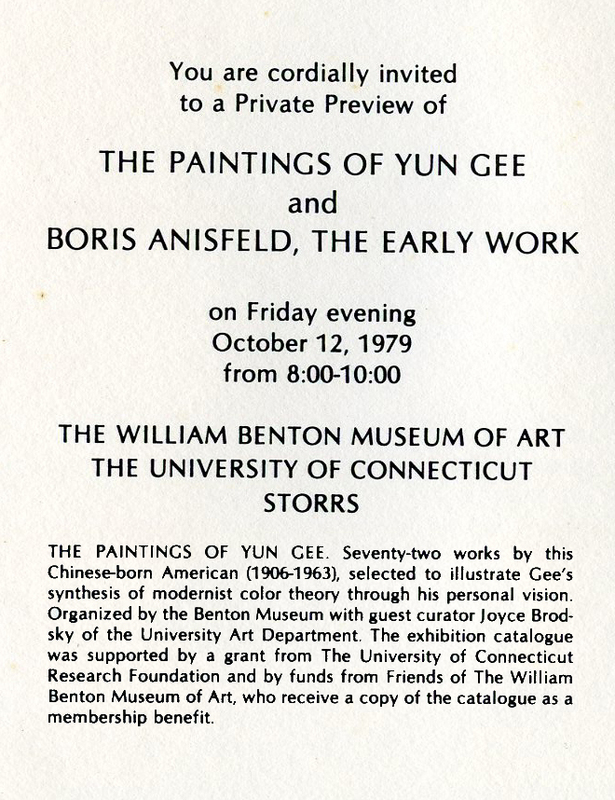 In Storrs “The Paintings of Yun Gee” is showing concurrently with “Boris Anisfeld, the Early Work” and an exhibition of prints by Reginald Marsh from the Benton Museum’s permanent collection.